The Cleveland Browns may have the sixth-best rushing attack in the NFL, but last week’s lopsided loss to the previously winless Jacksonville Jaguars apparently has the Browns coaching staff questioning the team’s direction. First off, quarterback Brian Hoyer had presumably solidified the starting quarterback spot after the Browns’ Week 6 win over the rival Pittsburgh Steelers, but one bad game against Jacksonville apparently has mounting pressure on the team to play touted rookie Johnny Manziel. Cleveland meets another winless team in the Oakland Raiders in Week 8, and ESPN Cleveland reported tonight (Sat., October 25, 2014) that if the Raiders get out to a lead on the Browns, Manziel might play in order to “spark the offense.” The report mentioned that the “internal conversation and pressure” to play Manziel has turned up considerably, only one week after Hoyer was nearly anointed the team’s savior. But the quarterback position isn’t the only place where the Browns are having controversy. Offensive coordinator Kyle Shanahan is reportedly not committed to keeping newly signed running back Ben Tate in the starter’s role. Tate sprained his knee in Week 1 and saw both Isaiah Crowell and Terrance West play well in his absence. He reclaimed the feature role when he returned, rushing for 124 yards in Week 5 and two touchdowns in Week 6, but he only managed 36 yards on 16 carries against the lowly Jags, who had been one of the most generous defenses for running backs. Shanahan recently challenged one of his backs to “separate from the pack” and become the team’s clear option, and even though all three will dress for tomorrow’s game against Oakland, it will most likely be Tate and Crowell who share the workload. 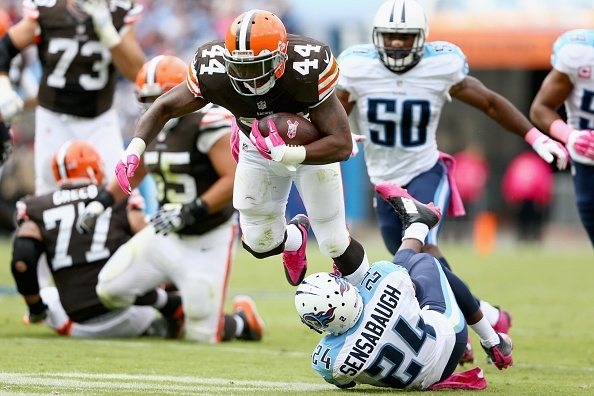 An impressive showing by Crowell could potentially see him overtake Tate as the No. 1 back. However, even though Tate looked a bit sluggish and one-dimensional against Jacksonville, it may not be his entire fault. The team lost starting center Alex Mack to a season-ending injury in Week 6, a devastating blow that has taken away much of their push on offense. That could mean serious trouble for Tate, Crowell, and whatever quarterback the team decides to play. Cleveland has one of the best offensive lines in the NFL, but Mack is nearly irreplaceable. So the Browns went from one of the NFL’s hottest teams to one of its doormats with just one loss. It may all be an overreaction, as a big win over a winless team could be just what the doctor ordered to quiet the rumor mill on Cleveland. If they lose, however, then we could be hearing calls for a complete overhaul.